"Everybody's homeless," said Karman Beller, a Camp Fire evacuee who's six-months pregnant. Jeff Hill lost his home and all he owned in the Camp Fire, which officials believe destroyed up to 90 percent of the housing stock in the town of Paradise, California. His employer, the Paradise Irrigation District, told him and his coworkers that they would be out of work for the foreseeable future because it would take weeks, even months, to get the utility up and running again after most of the town's infrastructure was destroyed. Hill and thousands of other evacuees without a paycheck or a permanent place to stay are facing the possibility that the 138,000-acre Camp Fire has left them homeless. "At this point, I’m taking it day-to-day," said Hill, 29, who has been staying with relatives in nearby Chico. "There are no stores left, no restaurants, nothing. If people did want to live there, there is nowhere to eat, no water or power. It’s not even habitable. It’s like we went back a hundred years. It’s just crazy." Brock Long, administrator of the Federal Emergency Management Agency, told reporters Wednesday that losses in Paradise, population 26,682, were "total." 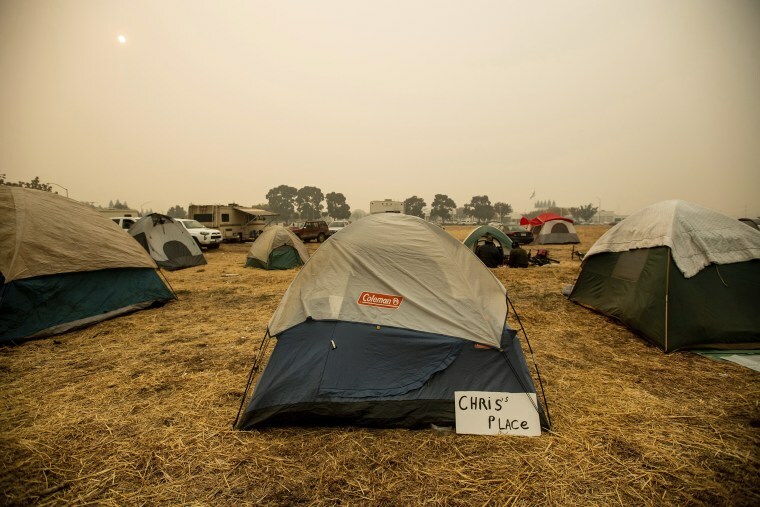 The disaster in Butte County, which has killed at least 56 people, comes as California is experiencing a monumental housing crisis and where nearly half of the nation's unsheltered live in cars, parks and on the streets. Even if destitute survivors receive federal and state aid to help pay for rent, there’s no guarantee they’ll be able to find a place in the Golden State. "The housing crisis hit us hard like everywhere else," said Sarah Thomas, program manager of the nonprofit Chico Housing Action Team. "The vacancy rate in Chico is around 1 percent. Now that we’ve lost all these homes in Paradise, there are going to be more people struggling to find a place to live." Despite the reality that about one in five Californians live in poverty, the median home value in the state is $544,900, and the median two-bedroom rent is $2,750, according to real estate listings site Zillow. Before the fire started Nov. 8, thousands of lower-income workers and retirees took refuge in Paradise, where the median home price is $200,900, according to the U.S. Census Bureau data. Evacuees have been setting up tents in parking lots, including at a Chico Walmart, while others are sleeping in cars or staying with family. Hill said as many as 20 of his family members have been staying in one house because they also lost their homes in Paradise. "What’s stunning is to hear family after family say, 'We have multiple members who lost homes,'" said Laura Cootsona, executive director of the Jesus Center, a homeless services nonprofit in Chico. Karman Beller, 33, who is six months pregnant, and her husband Ryan Beller, 30, lost their home and didn’t have renters insurance. They plan to stay with a brother-in-law who has taken in four other relatives displaced by the fire. "I’m due in three-and-a-half months," Beller said. "Trying to find a home with [no] funding is really impossible. Everybody’s homeless." Chico is the largest city in Butte County, but its shelters are usually full, even without 10,321 structures destroyed in Paradise. Richard A. Narad, operations manager of Chico’s Safe Space Winter Shelter Program, which adds 60 beds to the city’s shelter inventory for 12 weeks starting in mid-December, said that last year the program was "turning people away every night." "We already had a housing shortage in the county," he said. "We expect some people will end up on the street. It’s going to be a big problem until they figure it out. I’m guessing RV trailers will be necessary. I don’t think there’s enough hotel rooms." Joy Amaro, executive director of the Torres Community Shelter, said there are usually fewer than 250 beds in Chico, although the American Red Cross opened four temporary shelters in response to the Camp Fire. Two of those were at capacity immediately, a Red Cross spokesman said. Butte County officials said 1,385 Camp Fire evacuees were living in temporary shelters. FEMA has promised help for qualified, displaced residents — up to three months assistance for homeowners and at least one month for renters. "We do have the funds, and we will help out in every way we can," Gov. Jerry Brown said Wednesday. FEMA administrator Long said he had spoken to President Donald Trump on Wednesday and "his message is to take care of people — and that’s exactly what we’re here to do." In Oroville, a city south of Paradise, at least 200 evacuees set up camp in a parking lot last week. Tracy Grant went there to hand out hamburgers she made for them. She met Lee Brundige, a 93-year-old World War II veteran and widower who had lived alone in Paradise. “I had an instant connection with him, being a grandpa’s girl myself,” she said. So she and her husband took him in. "He’s all by himself with just his clothing," Grant said. She’s not sure how Brundige will carry on without becoming homeless. She thinks he needs to be in an assisted living facility, but she’s not sure he has the resources. The veteran fled with his cane and his vehicle on Nov. 8, driving in a conga line of cars to the parking lot in Oroville. Nearly a week later, he still wasn't aware that his house had been lost. "We got confirmation this morning that it is gone," Grant said Wednesday. "I haven’t told him yet." Jareen Imam and Stephan Kozub contributed.